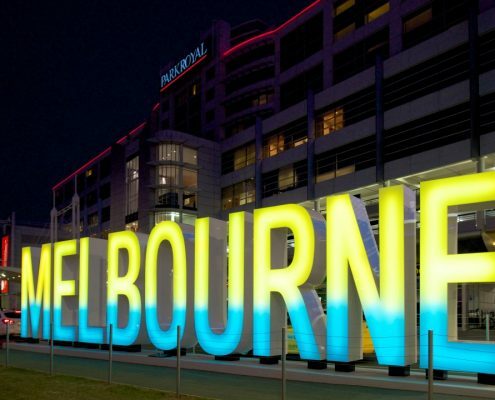 We had arrived late in the evening at Melbourne Airport from our Emirates flight from Singapore. We had booked accommodation a short journey from the Airport and so 15 mins later we arrived at our home for the 1st two nights of our Australian Adventure. We booked an Uber and headed into Melbourne for a day of exploring. We had been told that the weather in Melbourne can vary and you can get 3 seasons in one day, however our first day was one of the hottest days they had had of the summer. Our first stop was to purchase a travel card for our time there, its the cheapest way to travel as it gives you travel on the train/trams/buses, the myki card is the most economical way to get around the city. 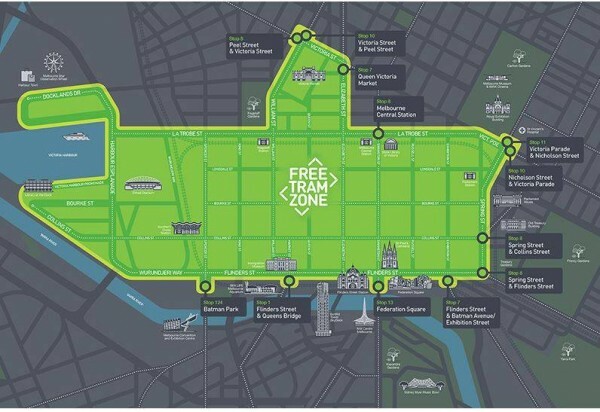 Melbourne has a great Tram service that connects all the areas of Melbourne, however the City Circle Tram provides a free service which is great for not just the local residents but also Tourists. The City Circle trams are old W class trams (route number 35) and it takes approx 50 minutes to do a complete loop. You can use it as a ‘hop on – hop off’ service and really enjoy all the sites that Melbourne has to offer as it takes you past some of the major attractions such as the Old Treasury Building, Parliament House, Shopping Malls and Parks. Melbourne offers so much and is known as the city for coffee, its supposed to be the place where the flat white coffee originated from. It didn’t feel a very big city and was very easy to get around. There are plenty of shops, cocktail bars, rooftop bars, of which we tried a few and restaurants. Explore the laneways, of which Degraves Street is considered the best with its Parisian looking lanes filled with cafes and on-street dining and we found a lovely restaurant beside the river to enjoy lunch in the sun. We had a few drinks in some of the local bars before returning back to our accommodation by train and bus, making full use of that travel card. Today we collected our car from the Airport and headed off to explore some of the areas around Melbourne. We had been recommended to visit St Kilda Esplanade Market set along the seafront with an intriguing array of stalls from jewellery, gifts, flavoured olive oil, soya candles, art and crafts. Its said that Melbourne has the largest number of Greeks outside of Greece itself so its no wonder that there is a quite a Greek influence in the city so its no wonder that this came across at St Kilda Market and so our lunch was a delicious gyros (a lamb and pork kebab wrapped in a flatbread, with tomato, onion, tzatziki) and a portion of chips, this was the first time we were introduced to chicken salt. On our 3rd day we packed up the car and headed off down the Great Ocean road, they were right about the weather though and it had definitely changed as we had drizzle most the day. We started at Torquay which is the gateway to Victoria’s Surf Coast stopping to take photos on the way. Lorne is very pretty and its here that you can explore the Great Otway National Park with its abundance of waterfalls or stroll along the cliff to Lorne Pier for some amazing views, its also here during May – September that you may even get to spot some of the whales showing off. We stopped off at Anglesea, where golfers share the scenic golf course with grazing kangaroos. We spent the night at Apollo Bay where we went for a walk on the beach before the sun went down had some amazing fresh fish for dinner at the Apollo Bay Seafood Cafe, a Greek owned restaurant, where Andy had Flake (a small shark) and I had calamari and chips as well as a couple of fresh oysters…. We continued our journey towards the Twelve Apostles. We stopped to admire the Split Point Lighthouse and there was a lovely little tea room at the top. There is also the 150 year old Cape Otway Lighthouse which is Australia’s oldest surviving lighthouses on the mainland and one of the top attractions on the Great Ocean Road. On the journey we also spotted a koala up in the tree, although he was a little shy!! We stopped in Port Campbell and bought ourselves some lunch, pitching up overlooking the bay to enjoy it before continuing along the road to the Twelve Apostles themselves. Arriving at the Twelve Apostles the dark clouds were coming over and the wind had picked up. We stopped at a few viewing locations before we arrived at the Visitors Centre where we were able to park up. There is a pathway that leads to the main viewing platform. The famous 12 Apostles are magnificent rock stacks that rise up majestically from the Southern Ocean on Victoria’s dramatic coastline. These were originally limestone caves created by millions of years of constant erosion, when these caves eventually became arches and then when they collapsed they left the rock stacks in the ocean standing up to 45 metres in height. The 12 Apostles are located only 275km west of Melbourne and approximately a 4hr drive along the Great Ocean Road.